As fall seems to be quickly approaching, I’m really trying to enjoy my more summery products while I can! I’ve been flipping through magazines about fall fashion, reading emails about fall beauty, & fall is in every store I’ve stepped foot in. But it is August guys! While I too am excited about breaking out my comfy boots & sipping something without ice cubes, this summer has flown by because of the move so I’m determined to enjoy some of it! Some of the most summer-looking packaging to cross my desk this year is from Mwah- check out the details on these lip products below! Mwah is uncompromising in its loud attitude, combining fresh, natural chemistry with innovative design, bold flavors, and colorful style. Our lip balms are 100% natural and use only the finest ingredients (no parabens, sulfates, or harsh chemicals), made in our 100% solar-powered facility in southern California, never tested on animals, and a portion of all profits are donated to the World Wildlife Fund. Mwah products are produced in our 100% solar powered facility in southern California. The sun nourishes the mangoes that go into our super-moisturizing formula and also powers the facility where Mwah is manufactured. The Mwah Sliders are probably my favorite- I just think they’re so cute! Whenever I pull one out of my bag I get questions from people. Mwah sliders are packed with delicious flavors and intense moisturizing ingredients like mango butter, shea butter and macadamia nut oil. They’re designed to fit comfortably in a pocket & they are really smooth to the touch. My favorite is the Coconut Chick but they also have Sweet Tart & Mango Tango. I find the texture on these to be quite thin & more oil based but it is really nourishing! These are the traditional lip balm tubes but they still have cute, punchy packaging. These come in Mango Madness, Creamsicle, & Strawberry Sweetheart. These are easier to apply on the go & actually have really secure lids. They also contain the same ingredients as above! None of these have a super strong scent or flavor so if you’re sensitive to that you’ll be glad! I actually just spotted these in Walmart over the weekend but they’re available in tons of retailers including Amazon. They’re pretty affordable too! 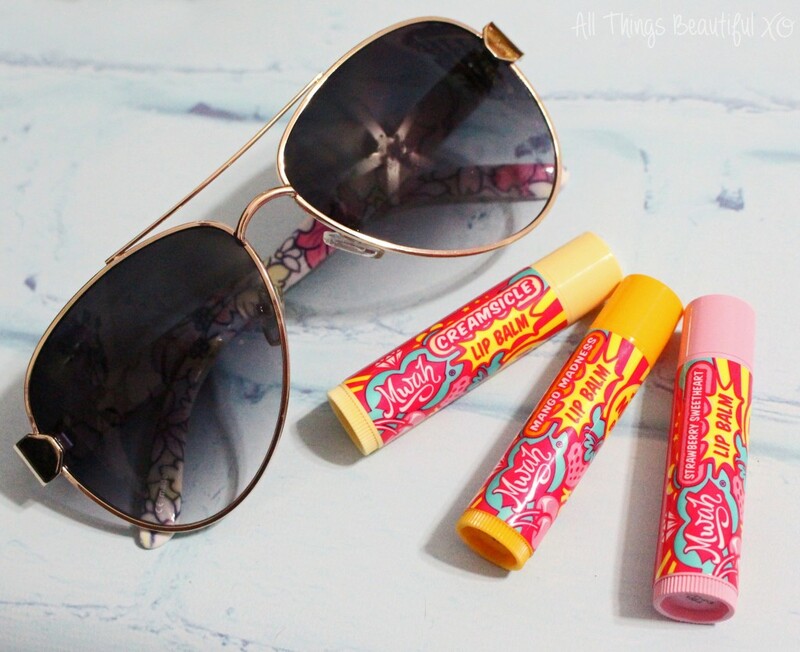 What are your favorite summer-inspired products this year? Favorite lip balm flavors? I’d love to hear about them in the comments below!